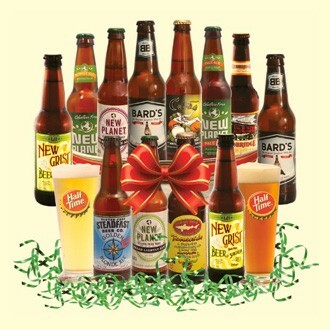 Find the perfect gift for your gluten-free loved one. We’ve compiled the best new treats and tools on the market including sweet cookies, kitchen gadgets, fashionable cookware and a beer lover’s basket. Wrap up your shopping with gifts that will warm their hearts and bellies this holiday season. Scroll through the guide using the arrows below. 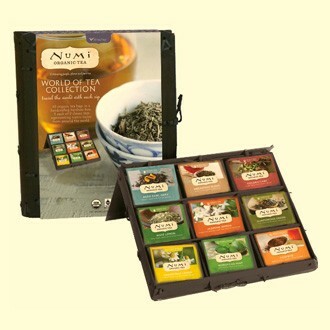 If you are looking for a gift for a tea lover, Numi Organic Tea’s World of Tea Collection could be the perfect find. Packaged in a sustainable handcrafted bamboo box, it includes nine organic tea blends with flavors from Europe, South America, Asia and Africa. The World of Tea Collection lets you spend the morning in Europe with an Aged Earl Grey from Italy or a Breakfast Blend from England. Take an afternoon trip to Brazil with Mate Lemon Green that combines lemon myrtle and green tea. A cup of Jasmine Green tea feels like a visit to Taiwan, Golden Chai a passport to India. For dessert, travel to South Africa with Rooibos’ hints of vanilla, Morocco with Moroccan Mint, or Egypt with a cup of Chamomile Lemon. Each box contains 45 tea bags, with nine of each variety. It would not be the holiday season without cookies, and now it’s easier than ever to give a gluten-free gift of cookie goodness. 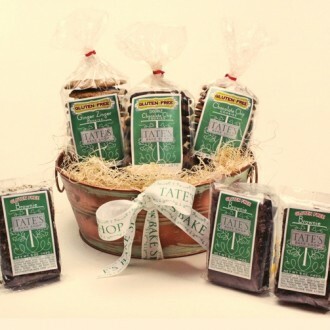 Tate’s Bake Shop, which produces its gluten-free cookies in a dedicated facility and recently expanded their gluten-free cookie offerings, has four gift basket options. Now you just have to choose – Ginger Zinger, the newest flavor, Double Chocolate Chip or Chocolate Chip. Each basket comes with three bags of cookies and three of Tate’s gluten-free brownies. If you really can’t decide, there’s a sampler basket with one bag of each cookie flavor and three brownies. Or you could go with a $50 gift card (good online only). Any holiday host will love Gluten Free Labels’ starter or ultimate labeling kits. These attractive but practical tags and labels can be used to designate gluten-free foods, containers and utensils. The durable silicon tags attach to pots, pans and more to designate them for gluten-free use. They are dishwasher, microwave and oven safe. The labels are made from heavy-duty vinyl and are perfect for Tupperware, frozen foods, condiments, butter dishes, refrigerator shelves, pantry shelves and snack drawers. Several have a finish you can write on, which is perfect for designating a gluten-free potluck dish. The gluten-free toothpick tags are another great way to signal which foods are gluten free in a fun, attractive way. 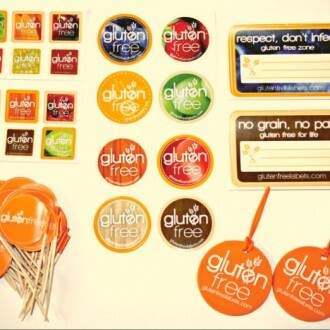 Starter Kit includes 12 mini labels, eight circular labels, two rectangular labels and two gluten-free silicon tags. Ultimate Kit includes 64 gluten-free flags, two gluten free silicon tags, 12 mini labels, eight circular labels and two rectangular labels. 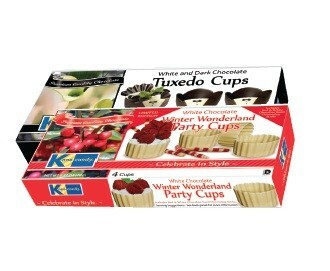 Kane Candy’s Chocolate Party Cups are the perfect hostess gift. A true dessert indulgence, they come in shapes from hearts to flowers to a tuxedo jacket and are made from gluten-free gourmet chocolate. Filled with mousse, pudding, sorbet or gelato and fresh fruit, they create a sophisticated show-stopping dessert that’s deceptively easy to make. The limited-edition White Chocolate Winter Wonderland Party Cups are especially perfect for the holidays. $5 – $14 per box, with 4 -12 cups ea. 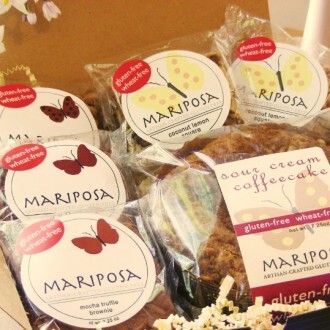 Finding a great gluten-free gift basket is a piece of cake, thanks to Mariposa’s wide selection. The California-based artisan gluten-free bakeshop offers holiday-themed biscotti and tea, coffee cake and coffee, and dairy-free combo gift sets, all shipped nationwide. The most popular pairs a sour cream coffee cake with coconut lemon squares, and triple chocolate and walnut brownies. Cuisinart’s Chef ’s Classic nonstick pizza pan will get a lot of use by gluten-free home pizza bakers. 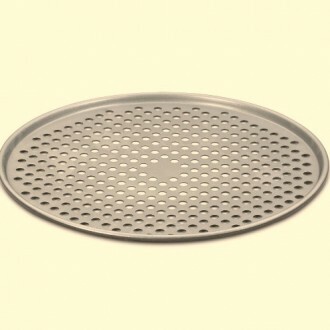 The 14-inch pan, which is dishwasher safe, is designed to distribute heat evenly during baking and to create a crispy crust with its perforated surface. For the perfect gift, pair the pan with a gluten-free pizza crust mix and a jar of gluten-free sauce. 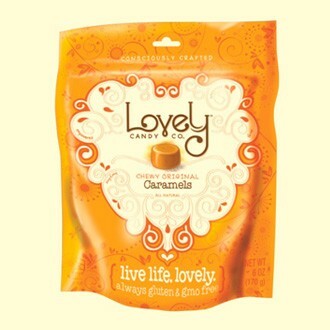 Caramels have really caught on lately and Lovely Candy is right on trend with its gluten-free products. The company offers an original flavor caramel that’s soft and buttery and a swirl that incorporates chocolate. The caramels would tuck nicely into a stocking or a gift basket. They were created by a husband when his gluten-free wife realized she could no longer have mainstream licorice. They are certified non-GMO and do not contain high fructose corn syrup. 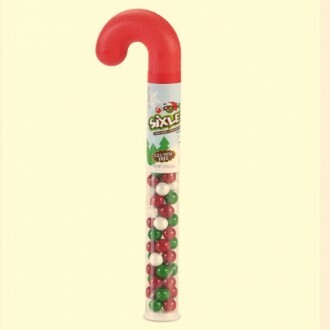 A candy cane filled with Sixlets can make it a little easier to stuff a holiday stocking for a gluten-free kid. The candy-coated, chocolate-flavored product from Sweet Works also makes a great gluten-free decoration for cakes, gingerbread houses and more. Available for a range of prices at stores nationwide. 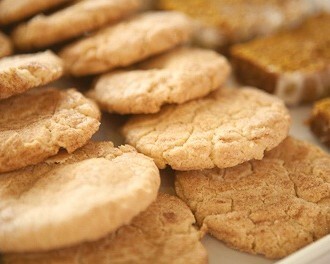 Tu-Lu’s Gluten-Free Bakery offers three varieties of cookies in half-dozen packages. Choose from chocolate chip cookies, dairy-free snicker doodles and a cookie that packs in oatmeal, cranberries and white- and semi-sweet chocolate. Mix things up with Tu-Lu’s sampler, with three chocolate chip and three oatmeal cookies, plus three of the bakery’s gluten-free brownies. All can be shipped nationwide. You can also give a gift card, which features the bakery’s signature spatula logo and is available in $10 increments from $20 to $50. 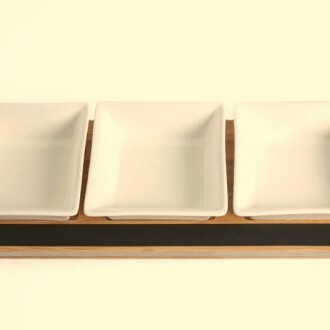 Great Useful Stuff’s appetizer serving tray seems tailor-made for gluten-free eaters. The tray has three removable, dishwasher-safe ceramic bowls that sit on an eco-friendly bamboo base. A chalkboard strip at the front of the base makes it easy to identify gluten-free options in each bowl at a holiday dinner or other gathering. If you have a totally gluten-free menu, the chalkboard is great for describing dips, toppings, types of yogurt, salsas and more. It’s a perfect gift for anyone who likes to entertain. 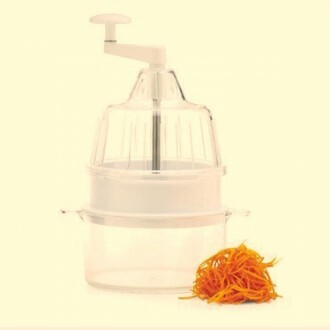 The Joyce Chen Spiral Slicer is sure to lead to creativity, experimentation and fun in the kitchen. The clever kitchen gadget produces spiral strands, ribbons or slices. It is recommended for garnishes and Asian salads and is dishwasher safe. Karina Allrich, who blogs as the Gluten-Free Goddess, recently used the slicer to make raw zucchini pasta. If you are looking for a sweet treat with zero calories, DII for the Home has an idea. 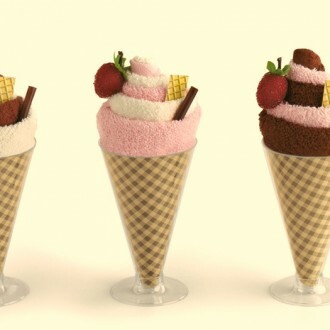 The company offers dishcloths that come adorably wrapped up as ice cream cones, sundaes and cupcakes. Each piece is made with a cotton terry cloth swirled inside a plastic cone, sundae cup or cupcake wrapping with a beaded raspberry on top. Pyrex’s Smart Essentials 8-Piece mixing bowl set is a spot-on gift for a baker, chef or someone who loves to dabble in the kitchen. The set comes with four mixing bowls in 1- to 4-quart sizes. Each bowl comes with a different color lid, making it easy to match them up. 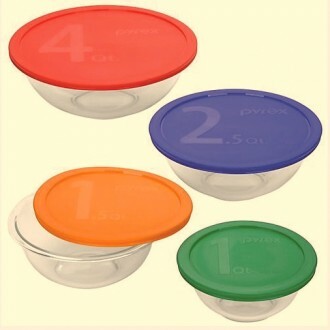 The bowls are stain and odor resistant and safe for the oven, microwave, freezer and dishwasher. And they are also great for salads and food storage. While croutons might seem mundane, gluten-free diners almost always have to make sure wheat-bread cubes don’t end up on salads. 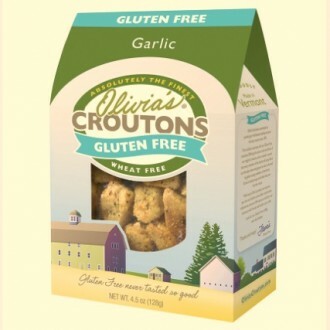 So a cute box of Olivia’s Gluten-Free Garlic Croutons will make an appreciated gift. The company has been making wheat-based croutons since 1991 but only recently added the new gluten-free flavor. They are made in a dedicated gluten-free facility in Middlebury, Vt., from gluten-free bread baked with millet, sorghum and brown and white rice flour. The croutons are seasoned with fresh garlic and rosemary. The company also recently launched Gluten-Free Rosemary & Sage Stuffing, just in time for Christmas dinners. 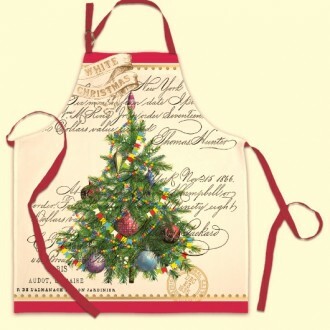 With all the extra baking duty that typically comes up during the holidays, aprons and oven mitts can get splattered and tattered. So a fresh new apron or oven mitt can be a much appreciated gift. Michael Design Works has many options. You’ll also find placemats and coasters that can brighten up a gluten-free table year round. 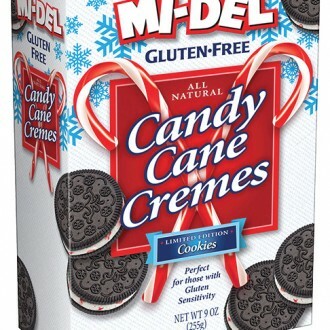 The flavors of Christmas combine in MI-DEL’s new, limited-edition gluten-free Candy Cane Cremes. Mint crème is sandwiched between two chocolate cookies. Paired with MIDEL’s seasonal gluten-free Gingerbread Men, they’ve got the tastes of the season covered and make perfect stocking stuffers. A gluten-free Santa might also enjoy them with milk. Available in select stores nationwide, prices vary. Populence is all about popcorn opulence. The company refers to itself as a popcorn artisan, and it’s clear Populence takes the presentation of its product seriously. 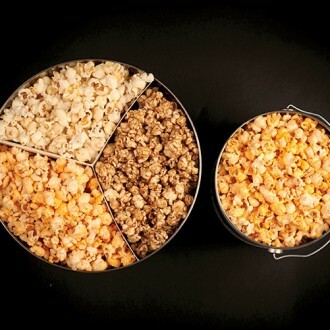 The gluten-free popcorn comes in six flavors that can be mixed and matched in 1- and 2-gallon gift tins. Each tin has room for up to three flavors. You can choose from kettle corn, chocolate drizzle with kettle corn, salted caramel, ginger caramel, ginger caramel with almonds, garlic rosemary, sun-dried tomato and jalapeno cheddar. The company also makes wine-infused popcorn, but it is not available for the holidays. Check in the spring to see if it’s back. 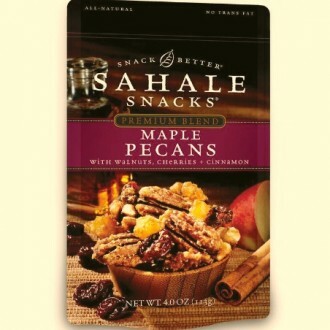 If you know a nut lover or anyone who likes to munch, Sahale Snacks has great gift ideas. Its roster of gluten-free nuts includes Southwest Cashews and Barbeque Almonds and nut blends like Sing Buri, which combines cashews with pineapple, peanuts, lemongrass and mild Chinese chili. Sahale launched its premium nut blends just in time for the holidays. Flavors include Pomegranate Pistachios and Maple Pecans. You’ll also find Sahale Snacks’ newly added Grab & Go 1.5-ounce pouches, which make a great addition to gift bags and stockings.